Thank you for coming out to help us last week. We are very pleased with the results of Mr. Pressure Wash’s cleaning of the severely clogged section of parking area at the Smokey Point Retail Center. Shawn and his team were very professional, and the porous asphalt is visibly improved and infiltrates water again. I especially appreciate how well they cleaned up and protected the site during their work. We would like to see what it would take to have you guys come out and clean the remaining 11,200 sqft. of porous asphalt on the property. Could you please put an estimate together for us? Thank you. If you want an environmentally friendly surface for your sidewalk or parking garage, what is the best material to use? Pervious concrete – this material functions as more than just a surface cover; it is part of a system for actually managing stormwater. A good system starts with good design, followed by proper construction and regular maintenance. In order to prevent or minimize the flow of sediment-laden water onto the pavement, design a system that coordinates with the surrounding landscape and uses curbs or other barriers to ensure that water flows where you need it. Closing construction may be challenging because contractors are probably unused to protecting pavements from sediment. Because of this, pervious concrete often becomes clogged with dirt, mulch, or other materials during this phase. Educate your work crew an if this still occurs, these materials should be sprayed off with a pressure washer or flushed through the pavement in order to restore the pavement to 100% infiltration capacity. Following the above advice for design, construction, and maintenance of pervious concrete will ensure your property has environmentally friendly surfacing that lasts. When the pavement is in the operational phase, it is essential to regularly clean the concrete, both for the life of your surface and in order to comply with Best Management Practices (BMPs). When the pavement is in the operational phase, it is essential to regularly clean the concrete, both for the life of your surface and in order to comply with Best Management Practices (BMPs). First, schedule regular dry sweeps of the entire parking lot or sidewalk. How often you sweep depends on the individual site, sedimentation sources, and the amount of traffic. A good rule of thumb is to sweep your concrete whenever there is obvious junk on it (leaves, sand, twigs, dirt, etc.). Asphalt parking lots are prone to producing sediment through normal wear and tear. 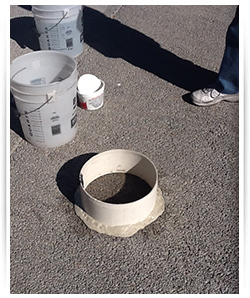 Asphalt parking lots are prone to producing sediment through normal wear and tear. Called raveling, the surface produces asphalt chips and sand, which show up quickly in the leading edge of any pervious concrete section. This sediment is primarily black or dark gray in color, unlike dirt sediments, which are usually reddish or brown. Sweeping is the first line of maintenance. Sweeping is the first line of maintenance. Be sure to use equipment appropriate to the size of the paved area – a walk-behind sweeper, a riding sweeper, or a truck-mounted unit, depending on the surface area that needs cleaning. The second type of maintenance your surface requires is regular pressure washing. The second type of maintenance your surface requires is regular pressure washing. The goal at this level of cleaning is to dislodge particles in the top portion of the pervious substance and to either flush them off the pavement or through it. Though pressure washing needs to be done less often than dry sweeping, if you have not swept your pervious surface in some time and it is soiled, you should pressure wash it. A good wash should restore adequate filtration to the pavement. You should always consider the type and sources of traffic that will use the pavement. You should always consider the type and sources of traffic that will use the pavement. If it will routinely receive traffic with muddy tires, for example, it will require more aggressive maintenance. If your surface has very high traffic or has been neglected, you may wish to use some type of vacuum equipment in combination with pressure washing so that the dirt and debris is sucked into the vacuum and permanently removed from the surface. This method is also advisable if you simply wish to reduce the number of times you have to clean annually. Mr. Pressure Wash uses water suction technology in conjunction with our power washing process to clean pervious concrete. Mr. Pressure Wash uses water suction technology in conjunction with our power washing process to clean pervious concrete. By doing this excess dirt is not pushed into the concrete causing deeper clogging; defeating the purpose of pervious concrete. This system comprises a fully integrated surface cleaning system that reclaims waste water and filters out contaminants. This reduces water waste, leaves no standing water, and aids in environmental compliance. It has a three-stage filtration system to remove contaminants and convert reclaimed water to reusable clean water. In addition, this process keeps the property owner compliant with all waste water regulations. Try our green pressure washing today! © 2017 Mr Pressure Wash, All Rights Reserved.